This massive source-book clocks in at 72 pages, 1 page front cover, 1 page editorial/ToC, 1 page author bios, 1 page SRD, 1 page advertisement, leaving us with 67 pages of content, so let’s take a look, shall we? After these essays, we delve straight into the significant array of crunch presented herein, with the Darkwater Spellbinder wizard archetype – essentially a wizard who receive access to an evil, water-themed school, including close range pummeling water-surges and lines of poisoned water. Nice! The Traitor to the Faith, intended for paladin/anti-paladin, is one that deserves special mention – it is intended for paladins/antipaladins that stray from the path of their intended alignment and codes of conduct – it is, in a nutshell, a way to retain a character as viable even though the alignment isn’t flipped on the head – we get mundane abilities that replace the supernatural/divine-themed one and a focus on powerful, mundane benefits that result from such a life, including synergy with Legendary Games’ twisted surgical procedure-rules, which are partially reprinted in the back of this book. While not perfect from a power standpoint, the narrative potential of this archetype is vast and its offering of a viable alternative to “sucky fighter sans bonus feats” can be considered well worth it. Heck, even beyond the frame work of paladins, this makes for a compelling character concept even without the lost divine component. So yes, I like it. Antipaladins seeking to remain in the good (haha!) graces of their vile patrons can enjoy becoming hands of pestilence, dread harbingers of disease and decay, including an inspired, multi-stage disease at high levels and appropriate imagery- grim and vile. And that is before the exceedingly deadly parasite-themed capstone. I like it! The gateway to godhood summoner is less interesting, though it will suit some tables – the idea is simple: Divine spellcasting, but a need to prepare the spells in advance and an eidolon that is beholden to the deity’s will, not that of the summoner. On the slightly nitpicky side, instead of noting that the expenditure of one feat allows the summoner to influence it via UMD, why not simply provide the feat? Would feel less wonky and adhere to the standard way in which such things are usually handled in PFRPG. Overall, still solid. The Herald of Godhood is pretty similar in focus – only that they exchange spells beyond the first level with combat-themed feats for either themselves or their eidolon, which may be called via the summon monster-ability of the class. Okay, I guess, but utterly ineffective and in need of some additional power. Finally, the vile virtuoso bard is pretty cool – replacing standard performances with command/forbid, inspired fanaticism etc. feel neat and the option to deliver performances through works of his/her twisted art can be considered downright awesome – perhaps it’s the Ravenloft DM in me, but I can see this one inspiring vast amounts of cool adventures – both as NPC and as PC. Kudos for this one! A new masterpiece to manipulate targets into feeling as if they were part of a deadly, righteous army does feel like it is employed on a regular basis by quite a few politicians to deadly effect – both in-game and IRL. Next up would be blood rites – which generally are very interesting – you receive 3 feats, which can be used for a huge array of effects: From granting pleasant dreams to locating lost, nearby objects, the uses of the feats range from the mundane folk magic-y style to the powerful, with blood-based spellcasting. These feats are powered by expending blood points and one can only have con-mod blood points at a given time. these regenerate upon resting and furthermore, can be replenished by inflicting char-level damage to yourself – each such increment of damage nets you one point. This means they can be utilized infinite times per day, provided you have a simple way of fast healing or regeneration, rendering the whole system broken from the get-go. The abilities themselves, while awesome in concept, simply do NOT work within the frame of PFRPG: 3 blood points, for example, ward a house versus accidental fires. Now this IS awesome on a concept side, but what does “accidental” constitute? A mishap while fire elemental summoning? Define “house” – does a castle work? If yes, what about the stables in the court? Included? Don’t get me wrong, these feats are thematically, conceptually, awesome – but they are not functional for PFRPG. They would work in the context of WoD or similar games, but in the highly codified rules-interactions of PFRPG, they ultimately provide wishy-washy absolutes that lack the necessary precision for smooth system-interaction – and yes, this includes lacking information on just about any rules-relevant interaction point, from ability-type to CL. The chapter also provides a blood point-storage item, as if the resource wasn’t infinite enough… Another significant problem I have here would rest in the constant reference of a blood mage and said mage’s resources – I have no idea to WHICH blood mage this reference points and it is neither hyperlinked, nor mentioned in the pdf, leaving me incapable of properly judging the interaction with said classes blood pool. Searching via d20pfsrd.com didn’t help either, so consider me puzzled -which leaves this chapter as high-concept, yes, but also as ultimately very, very flawed, in spite of a nice nod towards NotNW’s nice fiend-binding book. Apart from concepts, unfortunately a dysfunctional waste of space that is tantalizingly close to being the awesome chapter it ought to be and deserves to be. The next chapter deals with a plethora of evil-themed spells – from ones that net DR 5/good or lawful to vomiting acidic black bile on foes, there are several that elicited a sense of unimpressed déjà-vu, whereas other with their ability to conjure forth mythic aboleths have an interesting component – they work better for archetypes introduced herein. Self-harm-inducing bardic spells. Many of the spells utilize mixed energy types, with e.g. a mix of negative and force damage for a reflexive damage shield at 3d level feels like a bit much. A suffocating sphere of water, on the other hand, is rather interesting and works moderately well balance-wise when compared to similar spells. All in all, a solid selection, though not one that blew me away. The feat-chapter provides mainly an assortment of options for antipaladins, for extended auras and healing of evil, non-undead cohorts – on a definite plus, the pdf directly credits feats for their original publication if applicable – nice indeed! Developing an almost vampiric taste for blood in exchange for level-scaling SPs usable via touch of corruption. On the downside, the quoted microfeats have not had their language properly cleaned up, with bonus types etc. left out in the original due to the brevity of the format, not having been inserted for proper non-micro formatting – they may remain functional, but still. The diversity between cool and okay feats can be seen here as well, though I admit to really enjoying the feats that allow you to utilize touch of corruption to power scaling SPs. Brilliant would be the feat that actually presents a rationale for explaining your evil masterplan – the foes who have to listen to it have to save or receive massive penalties – this feat is downright BRILLIANT! I also love the option for high-level antipaladins to offer the ultimate temptation – in the form of wishes powered by massive drawbacks and uses of touches of corruption – after all, how else did they make those do-gooders fall? The oathbreaker template, which may fuel class abilities by draining charges from items, is VERY interesting and yet another way of making the concept of the wayward champion work -a massive template neatly lines up all the class abilities and provides essentially the option to play paladins/antipaladins of any alignment, with alignment-specific bonuses and abilities, partially powered by charge-draining, being provided over a significant array of pages. Step-by-step, ability by ability, the respective new tricks are provided – and they are, overall, rather solid in their wording. However, they do suffer from one particular oddity – they utilize, correctly, I might add, rules to take e.g. smite evil and replace every component, including the results etc. – while I applaud the difficulty this must have been, why not simply write the new ability and then finish it with “This replaces..”? Don’t get me wrong, I’m pretty impressed and the benefits are sufficiently complex and varied to hold my interest, but this is just the type of unnecessary over-engineering I tend towards as well. So if you mind stuff like that, consider yourself warned – personally, I have no issue with the concept and its somewhat convoluted rules-language. (And I downright love the utterly NASTY tricks the champion of sins abilities provide – nice scavenging grounds for Thassilonian-themed modules!) -so yes, overall, I like this chapter, in spite of the nitpicker in me complaining about rules-language deviating from the default in the presentation and a certain feeling that an alternate presentation may have been more concise. The pdf, as mentioned, also provides surgery and sanity-rules originally presented in LG’s “The Mad Doctor’s Formulary.” Since I have already covered that one, I’ll just point you towards it. Editing and formatting are good, though not perfect; I noticed a couple of minor glitches. The pdf’s layout comes with a 2-column standard and a used-parchment look that is solid, if not particularly printer-friendly. Artwork is thematically-fitting stock art and the pdf comes fully bookmarked with nested bookmarks and two versions – one linked to d20pfsrd.com and one unlinked – nice to see that, since I tend to click on links by accident while scrolling through the text! So, I’ll come right out and admit it – I’m a huge fan of Clinton J. Boomer’s writing – “The Hole Behind Midnight” is the better Dresden Files and Coliseum Morpheuon remains one of my all-time-favorite roleplaying games-supplements ever. 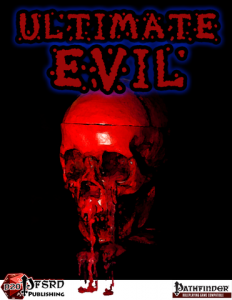 So yes, he and Peter K. Ullman have created a pdf that did not disappoint me – Ultimate Evil presents A LOT bang for your buck and more often than not, one can find some generally great pieces herein. Peter K. Ullman, who probably hates me by now for my reviews of his last couple of books, obviously has crafted some of these options – but know what? The man has improved! The rules syntax and semantics are infinitely more precise and while some of the wording choices may seem needlessly complicated, they can overall be considered functional and, in fact, fun! Kudos for the improvement!! Now some of these options oscillate in a pretty weird way – on the one hand, the exceedingly versatile options tend to end up as being pretty powerful. On the other hand, some are exceedingly conservative, especially among the spells. I honestly have a hard time rating this book, mainly because its problems are local ones – a slight over-engineering here, a non-standard rules-syntax there… The spells left me unimpressed, but I’m jaded. The feats range from superb to okay. We have the downright awesome, but slightly over-engineered oathbreaker-toolkit (which is, essentially, a complex archetype, not necessarily the template it professes to be) on the one hand, the non-functional blood rites on the other hand. We have cool high-level foes, but also pretty bland additional monsters. We have a couple of glorious archetypes…and some that are just not smart choices for most groups. We do have a mixed bag here, but one that is definitely on the better side of the spectrum, with the amount of nice options and ideas exceeding the bad ones by quite a stretch. Hence, my final verdict will clock in at 3.5 stars, rounded up to 4 for the purpose of this platform. You can get these options here on OBS and here on d20pfsrd.com’s shop!